Many birds dance to attract a mate, especially in springtime. From pigeons to parrots, birds like to show themselves off by dancing. Have a look at the birds near where you live and see what kinds of dances they perform. Ostriches are the only birds which dance for fun. Early in the morning, the birds gather and begin to dance in circles on tip-toes with their wings outstretched. Very soon, the whole group joins in with the twirling dance. Scientists think that this dance is purely an expression of joy at being alive! 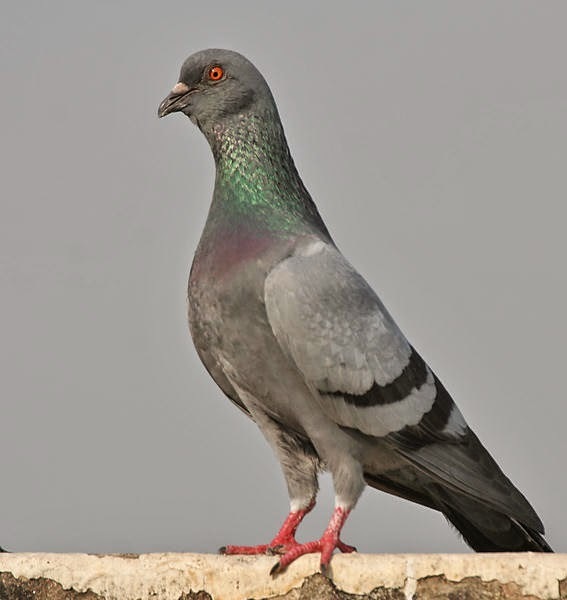 This highly variable city pigeon is familiar to all urban dwellers. Multicolored birds were developed over centuries of near domestication. Polytypic (12 ssp. ; nominate in North America.). Length 12.5" (32 cm). A medium-size compact pigeon with long wings and a short tail. Birds most closely resembling their wild ancestors are gray with head and neck darker than back, and a prominent white rump. Black tips on the greater coverts and secondaries form bold black bars on inner wing, and there is a broad black terminal band on the tail. Adult male: metallic green and purple iridescence on the neck and breast; iris orange to red; orbital skin blue-gray; bill grayish black; and feet dark red. Adult female: like male, but iridescence on neck and breast more restricted and subdued. Juvenile: generally browner, lacks iridescence; orbital skin and feet gray. The flightless ostrich is the world's largest bird. They roam African savanna and desert lands and get most of their water from the plants they eat. Though they cannot fly, ostriches are fleet, strong runners. They can sprint up to 43 miles (70 kilometers) an hour and run over distance at 31 miles (50 kilometers) an hour. They may use their wings as "rudders" to help them change direction while running. An ostrich's powerful, long legs can cover 10 to 16 feet (3 to 5 meters) in a single stride. These legs can also be formidable weapons. Ostrich kicks can kill a human or a potential predator like a lion. Each two-toed foot has a long, sharp claw. Ostriches live in small herds that typically contain less than a dozen birds. Alpha males maintain these herds, and mate with the group's dominant hen. The male sometimes mates with others in the group, and wandering males may also mate with lesser hens. All of the group's hens place their eggs in the dominant hen's nest—though her own are given the prominent center place. The dominant hen and male take turns incubating the giant eggs, each one of which weighs as much as two dozen chicken eggs. Contrary to popular belief, ostriches do not bury their heads in the sand. The old saw probably originates with one of the bird's defensive behaviors. At the approach of trouble, ostriches will lie low and press their long necks to the ground in an attempt to become less visible. Their plumage blends well with sandy soil and, from a distance, gives the appearance that they have buried their heads in the sand. Catatan : yang butuh terjemahan contoh report text di atas, silahkan menuju ke google.com/translate oke.